Review: Based on true events. Desmond Doyle is left devastated when his wife walks out on him and their three kids Evelyn, Maurice and Dermot the day after Christmas, 1953. With no woman in the house and unemployment the authorities start getting involved. The Church and the Irish courts take his children away and put them into orphanages. He enlists some helps from a new friend Bernadette Beattie, her solicitor brother Michael, their American lawyer friend Nick and Nick’s mentor Tom Connolly. Together they challenge a law before the Irish Supreme Court. The two best performances are Pierce Brosnan and Sophie Vanasseur who plays Evelyn. Not giving too much away, there is a scene where Pierce Brosnan’s character is singing in a pub. This is actually Pierce Brosnan himself singing and good for him. There is nothing wrong with his singing (although this might have got him in the Mamma Mia!, 2008 film!!). 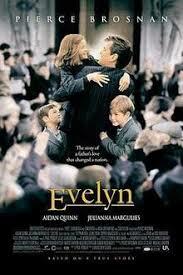 In the film Evelyn’s mother went to live in Australia: in reality she went to live in England where she raised another family. Also the real Evelyn Doyle saw her mother on more than one occasion but they never reconciled. On the back of the DVD cover this quotes “Doyle’s fight to keep his family intact becomes an uplifting testament to the strength of a father’s love and the power of the human spirit.”.